Hello lovelies, yes I have been gone longer than what is the norm for me, my apologies! Alas, I come to you with some of my favorite blogs to read. It seems everyone has a particular blogger or blog they read every time they come to this site! I've compiled a list for you my darling! Check these ladies out, I've probably annoyed them by commenting on all of their posts'; but I likes what I likes!! My daily reads range from the good old fashion post to a DIY. Give these ladies a lookey! 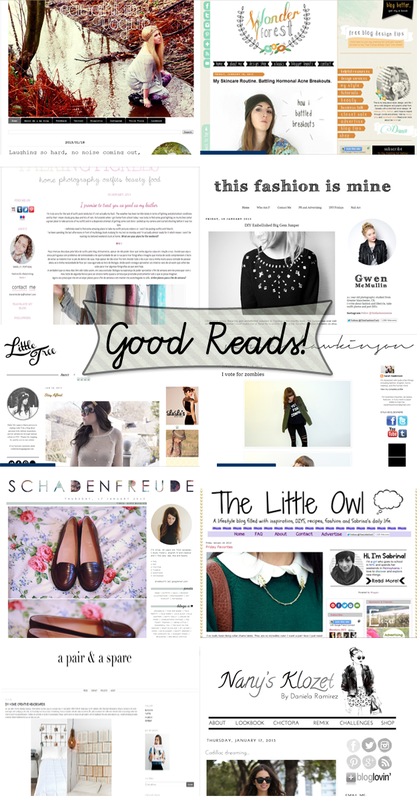 If you have any other blog recommendations do let me know in the comments! I'd also love to do a blog post like this featuring lesser known blogs... as I, myself am in that category! Since these are more well known blog I think it'd be great to share the love, even if I don't reach that many people, well not yet! Here's hoping! Let me know what you guys think about that? I'd also like to thank everyone for wishing me good luck in my last blog post about a potential new job! I'm humbled by your well wishes! With that I wish you all a great weekend! Most of those blogs are some of of my favourites as well! Two blogs that got me started were A Beautiful Mess and Oh So Lovely Vintage. Followed your blog can't wait to read more! Oooh I love wonder forest, nice collection of bloggers!